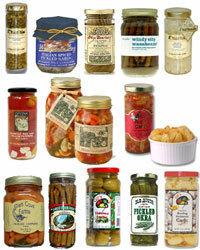 Pickled Veggie of the Month Club features a unique pickled vegetable selection every month. Each month we select hand crafted creations from smaller producers that you won't likely find on your local grocer's shelf. Examples include mushrooms, garlic, onions, olives, asparagus, beans, baby corn, pickles, green tomatoes, brussel sprouts, watermelon, carrots, peppers, okra, cauliflower, broccoli, beets, snow peas, artichokes and garden mix. See some of our past featured selections to the left. Available in your choice of one jar per month or two (different) jars per month. NOTE: this club can only ship to the lower 48.